The Avaya 1616 IP Deskphone supports basic communication needs with a backlit display, high-quality, full-duplex speakerphone and buttons with dual LEDs to offer easy-to-read status information. 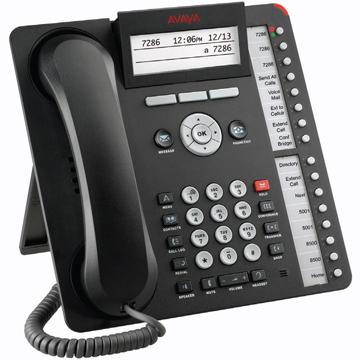 The Avaya 1616 supports 16 line appearance/feature keys and is an attractive upgrade from older equipment. It combines the features found in traditional and IP deskphones with fixed keys that provide access to the most common features. Flexible softkeys offer contextual guidance for easy use and maximum efficiency. The Avaya 1616 is designed for users such as receptionists, assistants and managers who answer incoming calls, transfer customers, and monitor several line appearances throught a typical day. Get more for less with features normally not available on similarly priced models, such as backlit displays, support for multiple call appearances, a two-way speakeprhone and dual LEDs. Reduce transition and training time by taking advantage of a familiar user interface. A lasting investment with security, reliability and performance.